Well here I am again! I finished a commission card this afternoon and its for a man! Now who hates doing male cards? Sometimes they just seem to be easy and other times you can't think of anything to do! That's was me a couple of days ago nothing came to mind so I thought have a play! So out came the few masks and the few Distress Inks that I own and this is what I came up with! I started off with a white piece of 8 x8 cardstock. Then I through the masks I have and decided which would suit a male card! I picked out 4 all of them from Splodgeaway!! I wasn't sure if this was going to work although I have these masks I've never used them before! So I decided to us the Owl. Now I've seen him used and he looked magnificent! I was just praying that this would turn out if only marginally like the ones I'd seen it would be ok! So out with the Owl and i used him with DI Brushed Corduroy. 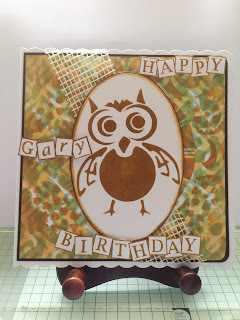 Then I cut him out with a xCut oval die and then edged it with a brown Promarker. After this I distressed the edges slightly with the DI Brushed Corduroy. So all that needed to be done was fix it all together. So I matted the background onto a piece of brown card stock then I wrapped a length of jute ribbon around both the background and the brown card and fixed it at an angle. So next came the little fellow, he's so darn cute, and I fixed him in the middle of the card with double sided foam pads! All that needed to be done was fix it onto an 8 x 8 scalloped card. I had my card for a male done except the Happy Birthday and the name of the recipient. I don't know if you've noticed but I do like to put their name on the card. Using Clarity boxed alphabet I stamped the greeting and the name in DI brushed corduroy cand fixed them onto the card with foam pads. Just an insert inside with a cheeky greeting and all was done. 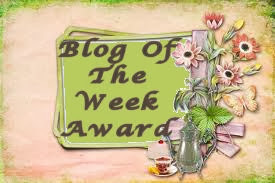 I hope I haven't been too long winded about this ( I have haven't I) and you have enjoyed your visit here. So Thankyou for visiting its very much appreciated. 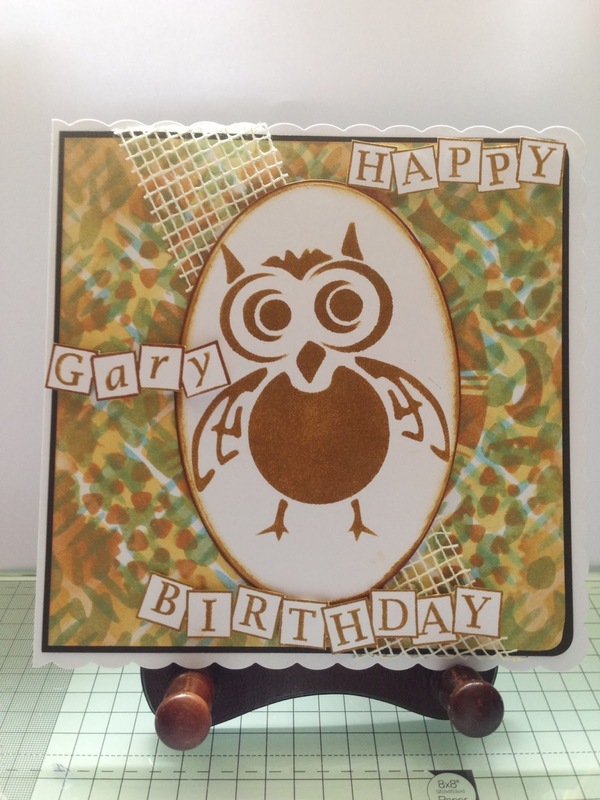 This is fabulous Pat, love the background you have created it looks stunning and so love the cute owl.